NOW Foods CoQ10 Veg Capsules contain the vitamin-like compound Coenzyme Q10, also called ubiquinone. It is an essential component of cells and is necessary for mitochondrial energy production. 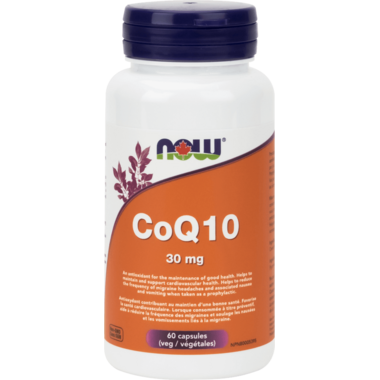 Years of research has shown that CoQ10 supports healthy cardiovascular and immune system functions in addition to its vital role in cellular energy production. Directions: Adult Dosage: For antioxidant and cardiovascular health: Take 1-3 Capsules, 1-3 times per day. For migraine prophylaxis: Take 3 Capsules, 2-3 times per day. Use for minimum of 3 months to see beneficial effects. Caution: Consult a health care practitioner prior to use if you are pregnant or breastfeeding or if you are taking blood pressure medication or blood thinners. Consult a health care practitioner if migraine frequency increases, and associated nausea and vomiting persist or worsen. Got this as part of my daily supplement. I could not find find it anywhere and then I knew that well.ca would have it and at a good price. Thank you for that. I can always have confidence that I could find what I need. Though I am not sure it is suitable for everyone but it is unbelievable I took this supplement for only 10 days this circle and I finally got pregnant!